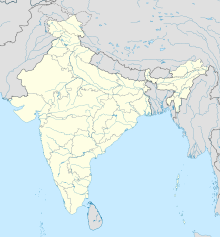 Thanjavur Air Force Station (IATA: TJV, ICAO: VOTJ) of the Indian Air Force (IAF) is located in Thanjavur in Tamil Nadu, India. It is home to a squadron of the IAF's Sukhoi Su-30 MKI super-manoeuvrable fighter aircraft - the first IAF fighter squadron in Tamil Nadu. The facility was expected to start functioning by 2012. However, the schedule was delayed and the airbase was inaugurated on 27 May 2013 by then Defence Minister A. K. Antony. The airfield was used by the Royal Air force during World War II as a base for its Lockheed Hudson, Vickers Wellington, Hawker Hurricane, and P-47 Thunderbolt aircraft. After the war the airfield was handed over to the government for civilian use and eventually came under the jusrisdiction of the Airports Authority of India (AAI). In the early '90s, Thanjavur was connected with Chennai via the Vayudoot Flight Service, which was stopped due to poor patronage. The IAF took over the airfield in March 1990. During the heavy floods in Tamil Nadu in November 2008, IAF helicopters operating from Thanjavur dropped 15,000 kg of relief materials to the affected areas. The airport is situated at an elevation of 253 feet (77 m) above mean sea level. It has two runways with concrete surfaces: 07/25 measuring 5,680 by 150 feet (1,731 m × 46 m) and 14/32 measuring 4,757 by 150 feet (1,450 m × 46 m). Recent aerial photography only shows extension of Runway 07/25 to 9000 feet with parallel taxiway and aprons under construction. ^ Airport information for TJV at Great Circle Mapper. Source: DAFIF (effective October 2006). ^ "IAF's Modernisation Projects' 75% Completion By 2022: Air Chief Marshal Browne". Defence Now. Archived from the original on 26 April 2013. Retrieved 24 March 2013. ^ "IAF to modernise, raise four more Su-30MKI squadrons". Hindustan Times. 5 October 2012. Archived from the original on 9 May 2013. Retrieved 24 March 2013. ^ "Thanjavur Air Force base to be a major one soon". The Hindu. Chennai, India. 11 August 2010. Retrieved 5 February 2011. ^ "Delay in Completion of Strategic Air Force Projects". Press Information Bureau, Government of India. 8 August 2012. Retrieved 24 March 2013. ^ Aerial image of Thanjavur Air Force Station. Google Maps. Accessed 24 March 2013.